We've been following the Fitbit smartwatch trail for quite some time, but only now are we getting a possible look at the upcoming device. Codenamed 'Project Higgs', the smartwatch has now leaked in a couple of press renders, showing off a watch that looks much like the Fitbit Blaze. 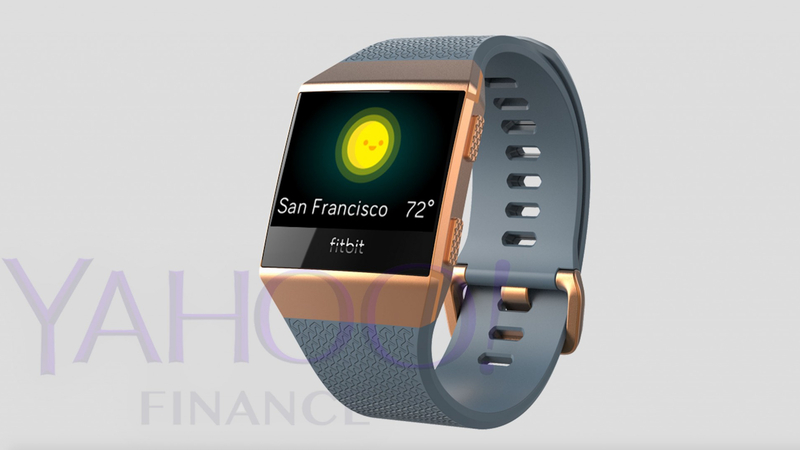 Yahoo Finance, which recently revealed that Fitbit was having production problems with the wearable, has published an image of the watch in two colour variants which you can see in the images above and below. It keeps the Blaze's square display, but instead of the chunky octagon it now keeps flush with the strap - it's a bit like the Fitbit Surge and Blaze had a baby. Also note the physical buttons on the side. Responding to a request for comment on the leak, a Fitbit spokesperson told Wareable: "We know there is a lot of interest in our entry into the smartwatch category. We don't have news to share at this time and do not comment on rumors or speculation." As previously reported, the watch is said to include a heart-rate monitor, built-in GPS, wireless payments and a display of 1,000 nits (that's the same as the latest Apple Watch). There will also be on-board music streaming from Pandora as potential partnership with Spotify was apparently ruled out earlier in development. It may well have something to do with the fact that Spotify is working on its own wearable. It's also expected that Fitbit won't launch with the app store it has been working on, and will instead launch with limited third-party support with a full-blown app store will then follow down the road. Fitbit is reported to have struggled getting the GPS and waterproofing right, according to prior reports, and Yahoo states that some employees were unhappy with the design Fitbit has gone with. The watch was also initially set for a spring launch, but production struggles have allegedly pushed it back to the fall. Pricing for the Fitbit smartwatch is expected to come in at around $300. The Yahoo report also revealed a picture of Fitbit's new sports headphones, codenamed 'Parkside'. They'll come in two colours, 'Nightfall Blue' and 'Lunar Grey' and are expected to follow in the design footsteps of Apple's Beats X earbuds. They are set to be priced in at around $150.